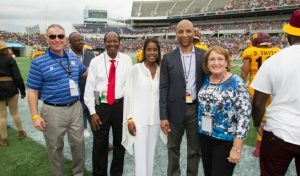 Mayor Teresa Jacobs and community leaders at the 2016 Florida Classic at the Orlando Citrus Bowl. Orange County and Central Floridians proudly welcomed thousands of roaring fans back to the Orlando Citrus Bowl for the annual Florida Classic in November with Mayor Teresa Jacobs participating in the exciting coin toss at the beginning of the game. The Citrus Bowl hosted the nation’s largest HBCU rivalry between the Florida A&M University Rattlers and the Bethune-Cookman University Wildcats for the 70th time and the 36th time as part of the Florida Classic. The score ended with BCU taking the game 35 to 14, continuing its winning streak for the fifth year over FAMU. The Orange County Board of County Commissioners supports the Florida Classic and awarded the Florida Classic Consortium with $137,500 this year to help fund scholarships for Florida A&M University and Bethune-Cookman University. The consortium receives the funds annually and consists of several members from both institutions including the presidents and athletics directors. Greg Creese, the Communications Director for Florida Citrus Sports, spoke of the importance of the game to Orlando, and why it remains a highly anticipated annual event for Central Florida. The Orlando Citrus Bowl recently reopened in 2014 as part of a $94.5 million venues package to transform Orange County into a mecca of economic, cultural, and sports opportunities to support the region’s increasingly diverse and creative population for generations to come. The new Citrus Bowl was constructed in less than 10 months and replaced 90 percent of the stadium with brand new construction, creating an improved fan experience and utilizing the latest technology in the region’s largest stadium venue. There are now 65,000 seats available for fans and three, large state-of-the-art video scoreboard displays. At the reopening of the stadium, Mayor Jacobs announced that the Rebels and Seminoles would open the 2016 season at the Citrus Bowl as part of the first annual “Orlando Kickoff Game.” The neutral-site season opening game between Florida State University and The University of Mississippi will be played on Labor Day, Monday, Sept. 5, 2016, and will be televised nationally by ESPN. Since being constructed in 1936, the Citrus Bowl has hosted numerous outstanding athletic events, including World Cup Soccer, Florida High School Athletic Association events, and many high-profile college and bowl games, as well as star-studded performances from iconic bands, such as the Rolling Stones, Aerosmith, and the Eagles. The Orlando Citrus Bowl also continues its tradition of hosting signature events, including the annual Florida Blue Florida Classic, Buffalo Wild Wings Citrus Bowl, Russell Athletic Bowl and Monster Jam. The stadium has welcomed families from all over the world and has created unforgettable experiences for many local residents and visitors from around the world.